Acclaimed author, poet, feminist, activist, and, at the age of just thirty-nine, winner of the Pulitzer Prize in Literature, Alice Walker is one of our most extraordinary living writers. From her discussions of black identity and feminism to ruminations on suffering and joy, Walker’s work has consistently displayed her extraordinary literary gifts, her fierce intelligence, and the deep political and spiritual convictions that have informed her work and life. Since her first short story, “To Hell with Dying,” which was “discovered” by the poet Langston Hughes in 1967 to The Color Purple and, more recently, her bestselling children’s book, Why War Is Never a Good Idea, Walker has inspired, critiqued, and pushed the limits of storytelling. 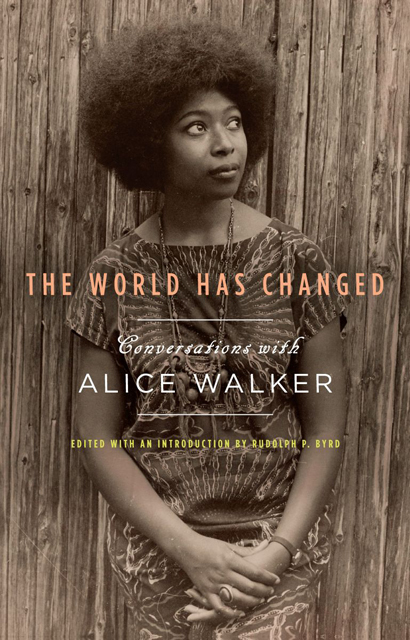 THE WORLD HAS CHANGED brings together a series of fascinating conversations with Walker, which offer an unprecedented insight into her career and her personal and political development. From Walker’s art and activism that have their origins in the segregated world of post-Depression rural Georgia to her 2009 trip to the Middle East to deliver humanitarian aid to the women of Gaza, this collection offers conversations and interviews with Walker from 1973 to 2009. The collection introduces us to the unique vision that is the underpinning of Walker’s extraordinary body of work. Her interlocutors are themselves significant literary and cultural figures, among them Margo Jefferson, Howard Zinn, Claudia Tate, and Paula Giddings. Each conversation and interview explores a different angle of Walker’s artistic and spiritual development, and together they offer a fascinating and moving look at the diversity and breadth of Walker’s vision. 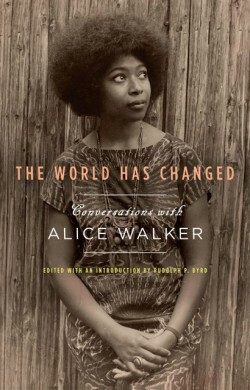 THE WORLD HAS CHANGED includes a chronology of Walker’s life and an incisive biographical essay by scholar Rudolph P. Byrd that not only discusses her work and its influences but also describes the writer through her personal stories: from her early family life in Georgia and the accident that caused her to lose vision in her right eye as an eight-year-old, to her marriage to civil rights attorney Mel Leventhal, including the text of a remarkable letter she wrote to her mother-in-law, who was deeply opposed to the interracial marriage of her son; from her years at Spelman and then Sarah Lawrence College, to her years as a teacher and being the first to teach a course on black women’s literature; and finally, from her time as an editor at Ms. Magazine to her continuing activist work and humanitarian views that permeate her work. The book closes with a final conversation with Byrd in which Walker reflects on the election of Barack Obama as president, on the books that have influenced her most, on her preoccupations as an artist, and on raising chickens.